VOODOO CIRCLE: enter official charts in Germany! In the end it’s really the quality that counts… proof: the success of VOODOO CIRCLE‘s new album “Broken Heart Syndrome”, which was released on February 25th. After the first sales week the album enters the Germany’s official album charts at a sensational #64! This surprising success somehow reflects the very special character and steadily increasing success of Alex Beyrodt’s VOODOO CIRCLE. “It’s one of those days, I’m so grateful to be alive. I always believed in my vision to keep the spirit of the old masters alive – thanks to each and everyone out there who bought the album and made it such a success”! “For me it’s the biggest sensation since the chart-entry of the first Primal Fear album. I always had the feeling that this album is something very special. I’m proud of the band, thx to the fans & our partners”! 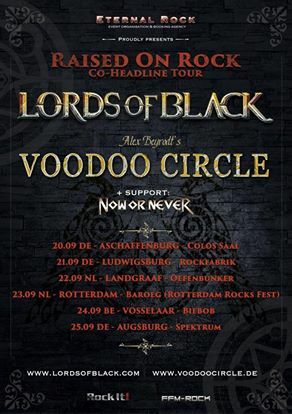 VOODOO CIRCLE are now working on a tour, festivals and live shows to bring the music of “Broken Heart Syndrome” where it belongs: to the stages!